While manufacturing a PCB, there are many factors that will influence the performance of your PCB. One of them is the thickness of your PCB. The thickness will affect the conductivity and resistance of your PCB and so you will have to choose the perfect thickness so your PCB can fit its applications accurately. In this article we will discuss the various standards of thickness available for PCBs and how you can choose the correct standard for yours. There are a number of things to consider before you make your choice. The application is a major factor but the profile, weight, components etc. all play a part too. Over years the size of PCBs has grown smaller, lighter and thinner so the thickness should also fit these standards. The number of layers your PCB determines the overall thickness of your PCB. Some applications require a thicker PCB while some require a thinner type. SO the thickness has very varying standards. The typical range of thickness for the core and prepreg combined is between 0.008 -0.240 inches. PCBs can be single sides, double sided or multi layered. The typical thickness is 0.063 inches (1.57mm) which is a standardized level from the past. This is because of the 0.063 inches plywood sheets used as substrates in electronic devices during the plywood industry. Today,the thickness range however is 0.008-0.240 inches which you can choose from. This is because of the development of multi-layer PCBs. Also over time, the use of substrates better than plywood started for example, epoxy. Copper plays a role in the overall thickness of the PCB. The copper thickness usually depends on the current passing through the PCB. 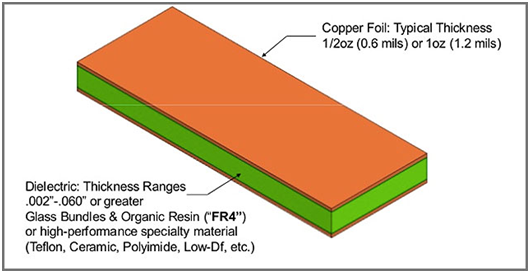 The standards copper thickness is roughly 1.4 mm to 2.8 mm (for internal layers) and 2-3 oz. (including the external layers). The thickness is adjusted according to your requirements. Keep in mind that increased copper means higher price and challenging processing. PCB trace thickness is usually specified in by the designer. Usually when the current flow increases the copper traces can overheat and can damage the PCB. So the trace should be thick enough to accommodate the higher current without overheating the PCB. To determine the proper thickness the amount of current passing through the PCB is compared to the rise in temperature. The width that can accommodate the average to maximum operating temperature is the thickness. 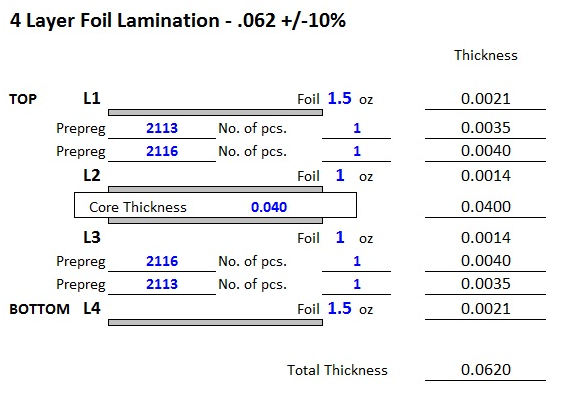 You can specify the thickness of your PCB by using a trace width calculator. Simply input all the specifications and the calculator will give you the requirement average thickness. Factors such as the prepreg thickness, solder mask thickness etc. is required. You can calculate up to the hundredth of a millimeter to ensure accuracy in measurements. When choosing thickness remember that a thicker board is less likely to break as compared to a thin one. Unless the application calls for a thin board, it is better to stick to a thick one. The following factors should be kept in mind while choosing the thickness of PCBs. 1. Weight: A thinner board will break easily as it is more brittle. Therefore thicker boards are preferable unless the applications require a thin board. 2. Flexibility:Thin boards are more flexible as compared to thick ones but can break easily. Thick boards are less flexible and are heavier. 3. Space Required: If your device will have larger space for a larger PCB then using a thicker board is better but if you have a smaller device then it will require a smaller board. 4. Connections and components: The type of connectors and components you use will also require a certain thickness. 5. Impedance:It is integral to match the thickness of the board to the impedance. This is because the thickness of board is actually the thickness of the dielectric and the dielectric helps with impedance control.